ACLD’s Family Support Services Programs assist the families of individuals with developmental disabilities with the goal of maintaining their family member within the family unit. This is accomplished by providing a variety of services. This is a grant program designed to provide information and referrals, life planning assistance and transitional planning awareness to individuals and their families. This program also gives information and referrals to local schools, hospitals and other agencies. ACLD’s Family Support Services Programs assist the families of individuals with developmental disabilities with the goal of maintaining the family members within the family unit. ACLD’s Strive Program is a Medicaid Waiver Service providing Supplemental Group Day Habilitation to adults. Strive offers recreational and volunteer opportunities for enhanced community involvement and enjoyment based on the interests and preferences of those attending. Strive is designed to expand socialization skills and opportunities, money skills, basic safety skills and communication skills as identified in Individualized Service Plans (ISP) and Supplemental Day Habilitation Plans. There are three ways to make strides with Strive. We offer a Strive Group for people who need enriched support and prefer to work on site or participate in community recreational activities that do not involve cost, crowds or strenuous activity. Our Strive on the Go group offers opportunities to volunteer in the local community and to participate in relaxed pace activities that are low or no cost. The Strive Travel Group is for people who prefer to be out in the community enjoying recreational activities while working on skills to enhance their socialization and community independence. The Strive Travel Group activities usually require members to pay the cost of admission/tickets for the activities they choose to join. Strive is available to adults, who are Medicaid eligible and approved for services through the Office for People with Developmental Disabilities (OPWDD). Our program location supports people living in Nassau county and western Suffolk County who reside in their family home, in a Supportive IRA or in Family Care. Strive operates on Saturdays and Sundays from 9:30 am to 5:30 pm. Times may vary for the Strive Travelers Group depending on the activities planned. Door to Door transportation is provided. ACLD’s Respite Services offer temporary relief of care responsibilities to primary caregivers with family members who have developmental disabilities living in the home. ACLD offers opportunities for respite services in the home or at our site-based location. Respite Services can be provided to people with a documented developmental disability who meet OPWDD eligibility requirements. Respite Services can be provided only to individuals residing at home with their family. In Home Respite is available to both children and adults. ACLD hires Respite Counselors who come to the family home to temporarily relieve the primary caregiver of their responsibility. ACLD has Respite Counselors on staff or the family may refer a trusted person that ACLD can hire if he/she meets the requirements to hold the position. Our Respite Voucher Reimbursement Program is available to children without Medicaid to hire their own Respite Counselor and be reimbursed up to $500 per year through an OPWDD grant. Families may only use one agency’s reimbursement program per year and must complete an ACLD receipt to request funds. ACLD’s Recreation Program offers unique and exciting activities to more than 60 adults living on Long Island. The Recreation Program is available to people living with their family or in a certified residential or apartment program. Members are offered activities on most non-holiday weekends. Support is provided to members by trained, experienced and enthusiastic Counselors. Counselors encourage members to build social skills while having fun! Services give members the opportunity to enjoy activities offered in the community as well as those offered at ACLD sites. Three times a year schedules are sent to members listing the activities available for the four-month long “trimester”. Activities offered are varied to provide options for all member interests. Examples of our most popular activities are: Bowling, Movies, Local Theater, Broadway, Sports Events, and Parties. Members register for the activities they would like to attend and meet the group at the designated meeting spots for Nassau and Suffolk Counties. ACLD’s Recreation Program is a fee-for-service program that does not receive funding from the New York State Office for People With Developmental Disabilities (OPWDD). Potential members are invited to try out two activities at a non-member price. Opportunities to get out of town and enjoy a weekend trip are offered annually. The program has traveled to New Jersey to visit Great Adventure and Medieval Times, to Split Rock Resort in Pennsylvania and to Mystic, Connecticut. On Wednesday evenings from October through May, approximately 30 people enjoy bowling at Levittown Lanes. 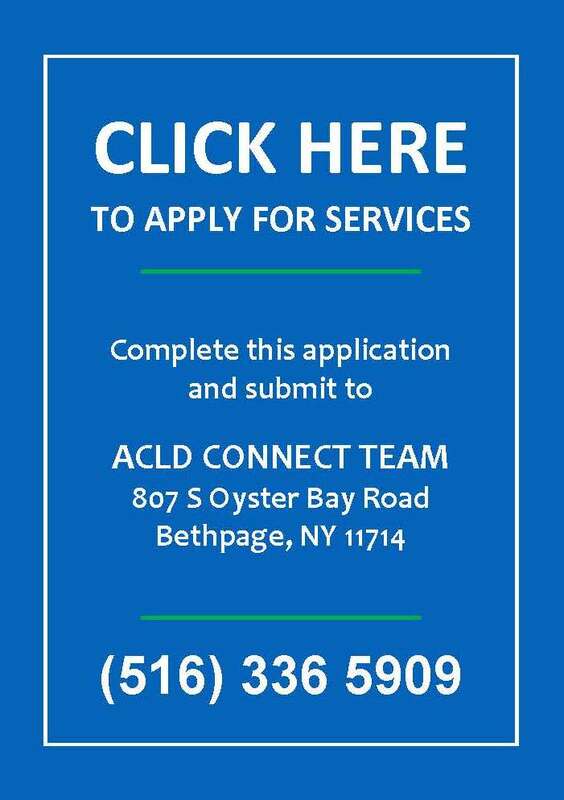 If you are interested in receiving any of these services, please contact ACLD’s Connect Team at (516) 336-5909 Extensions 171, 242, and 370.